When your turn begins, either lose 1credit or trash Lewi Guilherme. The Corp's maximum hand size is reduced by 1. 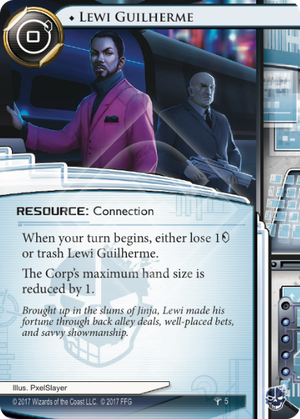 At the start of the Runner's turn, can they choose to trash Lewi Guilherme and use Fall Guy to prevent Lewi from being trashed? Well this is an interesting card. It drains credits continuously but that's something a good criminal player should be able to play around fairly easily (though beware of NBN tricks like Closed Accounts). Reducing the corp's hand size would be meh for anarch and shapers but it's pretty good for criminals now that Jackson Howard has retired. The key is agenda flood. With sufficient remote pressure corps will either need to keep agenda's they draw in their hand (potentially pushing out other useful cards) or in archives (dangerous, very dangerous). Now normally the chance of accessing an agenda in HQ with a single access is 20% (1/5) if there's 1 agenda in there, 40% if 2, 60% if 3, etc. With hand size 4 it's 25% (1/4) if there's 1 agenda in there, 50% if 2, etc. Assume for a moment that the corp has 2 agenda's on hand. That's a fairly common situation. That means Lewi Guilherme will increase you chance of stealing an agenda on single access by 10%. A subtle but important side effect is that by reducing the corp's hand size you're simultaneously reducing the corp's discretionary hand size by an equal or higher degree. What I mean with discretionary hand size is the spots the corp has in their hand for cards they choose to keep in hand to play at a later moment but don't have to keep. Admittedly it's a somewhat blurry concept since the corp could just discard agenda's as well, but generally corp's will feel compelled to keep agenda's whereas keeping assets and operations and such is a tactical choice. Assuming the corp has two agenda's on hand again. That means they've got 3 spots for all their IPO's, BOOM! 's, etc. If you reduce the hand size to 4 suddenly the space for non-agenda cards goes down to 2, meaning a 33% decrease. That forces very painful choices for the corp, e.g. it will be difficult to combine a deathblow setup with anything like economy support. Of course as a runner you will generally not know how hard this effect is hitting, but it will impact the corp's game to some degree at least. Note that you don't have to keep Guilherme installed. You can just decide to trash him if you don't see him earning his weight or you have a replacement on hand. Beware through when playing against Skorpios if you trash him.